Yes, it’s been a while. But I’m not apologising for that. I’ve got a life, like everybody else, and it does get in the way. I’ve found the best way for me, personally, to approach blogging is to treat it as an on-going diary which will be a bit sporadic when I’m otherwise occupied. There’s really no point in creating a burden for myself in the form of self-imposed pressure to write a blog post twice a week. So I’m not going to. I’m not apologising but if I write about what I’ve been up to, it is inevitably, a kind of explanation. Mostly, during the month of March it’s been work, sheer hard graft with several trips away and some long hours put in on keeping the wolf from the door. 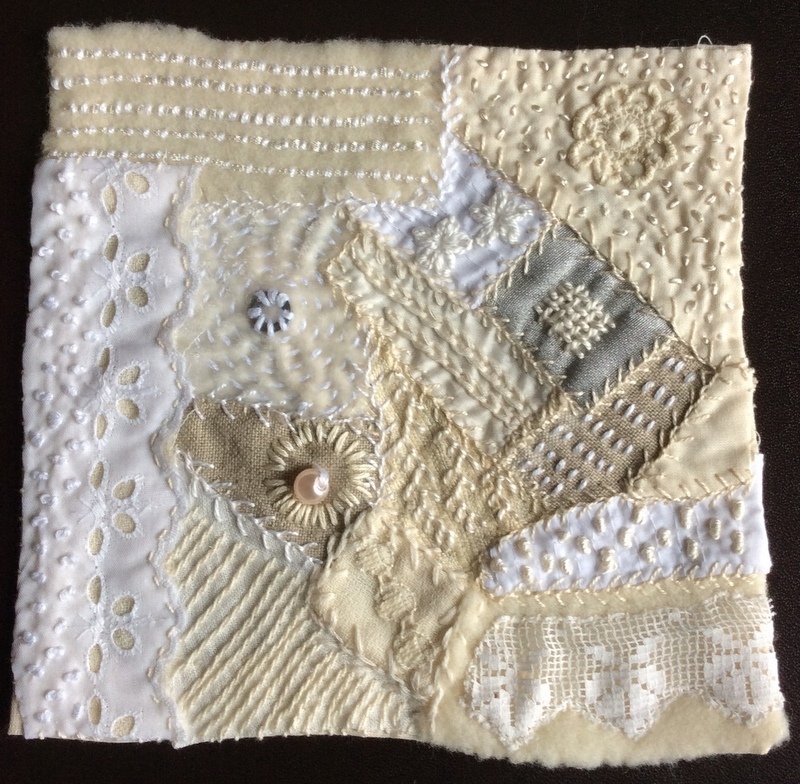 But I have been doing quite a lot of stitching in the interstices (I love that word) and I’ll show some of it on the blog over the next week or two. In the meantime, here’s a picture of one of my thread boxes. I think I’ve written in the past how useful I find the cheap wooden drawers from IKEA. 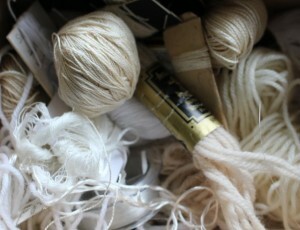 I keep commercial stranded cotton in small plastic boxes, and my own dyed threads are in the dyed thread drawer. Everything else goes into these sets of wooden drawers, sorted and classified by colour. They are small enough to be manageable, but large enough to contain what I’ve got. When I want threads of a particular colour I can spill the contents of a drawer onto the desk and rummage about to select things. And tidying up them up afterwards doesn’t take very long. It satisfies my orderly accountant’s mind to have things filed away and tidy. This is, obviously, the white and cream thread box. It’s somewhat depleted at the moment because I’ve been using neutrals a lot. Those of you who follow this blog may have read my posts in late January and February about whitework. I loved doing so much work around the theme of white but I must say that since then I’ve been enjoying getting back to colour. More on that soon. Earlier in the week I said I’d write another post about progress on a more resolved piece of whitework on paper. Well, here it is, and somewhat to my surprise it’s actually finished; I got a second wind with it yesterday and managed to complete it. 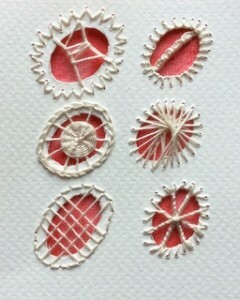 As with the sample, I drew ovals freehand on a piece of watercolour paper, and then cut them out using a craftknife. Then I used as many different Richlieu and cutwork techniques as I could think of to fill in the cut holes. I think I’ve made a few of them up myself. Some are more successful than others, it has to be said. I’ve used only one thread for all of this – coton à broder which is one of my favourite threads. I bought a very large hank of it in écru, but it’s nearly all gone now. If I extend this work, it would be interesting to use a more limited range of styles, perhaps using identical repeats. I don’t know – I’ll see. Maybe it’s time for me to draw the whitework to a close and get back to colour. But dipping my toe into whitework again has been a very pleasant interlude. I’ll no doubt return to it someday. Yes, folks, it’s yet another whitework sample on paper. I’m really rather taken with working on paper, although I should add that it’s more like card than paper as it’s quite a thick sheet from a watercolour pad. I cut out some ovals, using a craftknife, and then tried to use a range of techniques to fill in the spaces. The red backing is more watercolour paper, painted using Derwent watersoluble pencil. 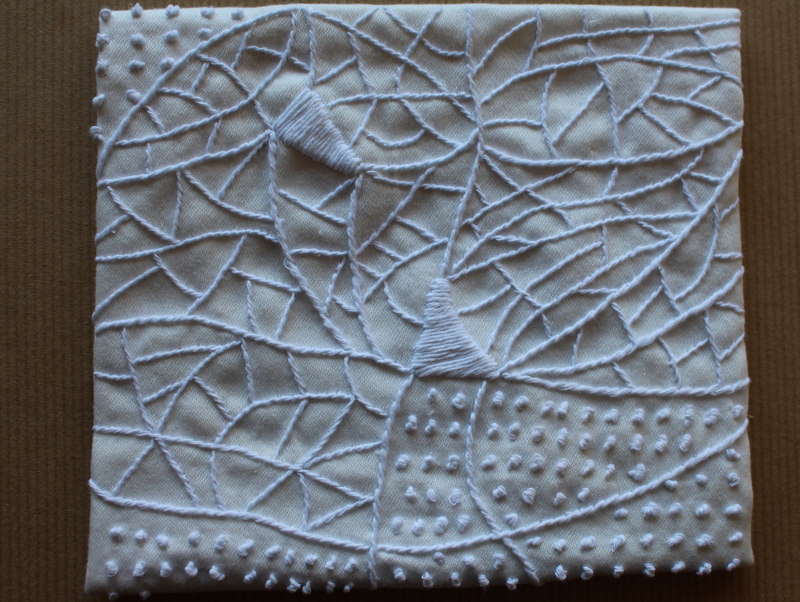 The techniques are drawn from Tracy A Franklin and Nicola Jarvis’s book on whitework, which I like very much. This sample is based – very loosely – on Chapter 4 on Richlieu work and cutwork. Whitework techniques do tend to be labour intensive and this one is no exception. I didn’t keep an exact note of how long it took me, but it’s not a quick process. I don’t have much interest in reproducing very detailed examples of old-style whitework, but the techniques (drawing threads, cutting holes and filling them up again, etc) are interesting and well worth trying out. This is really just a fragmentary sample but I’ve used it as a basis for a somewhat more ambitious piece. I’ll get back to you on how I’m doing with that later in the week. It’s got cotton and silk threads, as well as a bit of rayon. 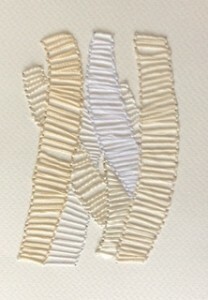 The creamier coloured threads have come out quite yellowy in the photograph, but they look much more neutral than they appear here. I put in lines of backstitch on the verticals but wasn’t completely convinced, once I’d finished, that they were necessary. I’m still very pleased with the technique, overall, and may well do more of this. Perhaps I’ll introduce a bit of colour next time…. It is stitched entirely using a thick-ish rayon thread which is part of a collection of very old threads that I was given many years ago. It’s not easy stuff to work with because it snags on everything, including rough patches of skin on my finger ends (of which there are many). However, I persisted with it, and I’m really quite pleased with the result. 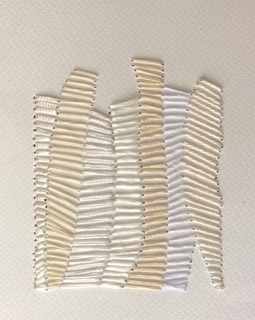 Because it’s quite a thick thread it casts shadows, so it’s easy to ‘read’ even though it’s off-white thread on an off-white background. 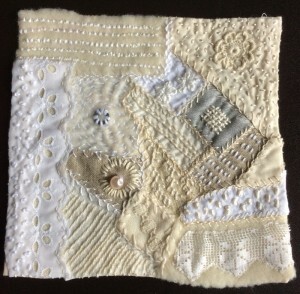 I am busy working on some other samples so will report on progress over the next few days. It may be a reaction against all that cochineal that I’ve been using recently, but I found I felt very much like concentrating on white for a while. I’ve been away from home for a few days, with just a limited range of materials. I’ve got a box full of various white fabrics: silk, linen, gauze, calico, silk velvet. 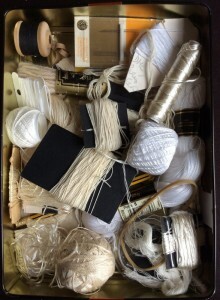 And a box of threads (see photo). 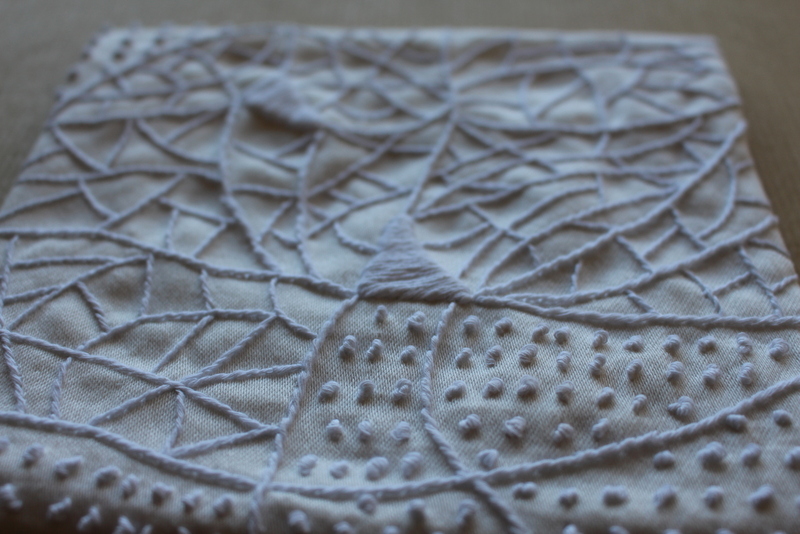 And a small box of lace, which I love. Years ago, when my children were very small and I was at home most of the time with them, I used to get time off on a Monday evening to go to a lace-making class. And then, at intervals during the week, I’d find time to make a tiny bit of lace. But it’s very time-consuming making bobbin lace, and once I started full-time work I really didn’t have any spare time for it. 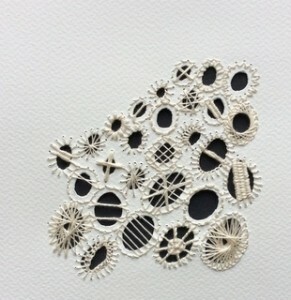 However, it’s left me with a diminishing legacy of hand-made lace which I use occasionally in projects. 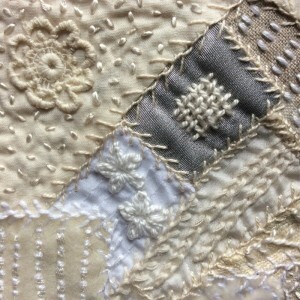 It’s lovely to incorporate materials with which you have a very close connection. And there are few connections closer than a thing of beauty which you’ve made yourself using only fine thread. I’ve probably mentioned before that I’m interested in the crazy patchwork that was in vogue in Victorian times. Rather garish, some of it, but an interesting example of the whole being greater than the sum of the very tiny parts. 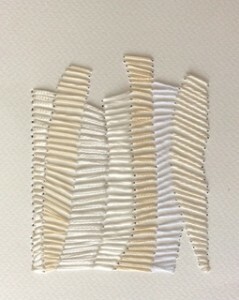 I thought it would be interesting to strip all the colour out of this style of work and to produce a piece using only white or off-white materials. Without colour, the only scope for interest is texture and the minimal contrast provided by the neutrals. You’ll see that I perhaps didn’t quite manage this: the neutral linen comes out looking surprisingly dark in contrast to the white, and I used the silvery pale grey silk gauze folded in four, so it too looks quite dark. But mostly it’s white. In the bottom of my tin of white and off-white threads I found a few beads and a washer or two so I’ve incorporated them as well. This was not a particularly taxing piece to do. I put very little thought into composition (it’s crazy patchwork, after all), and just added embellishments as they occurred to me. But I did enjoy it making it very much. 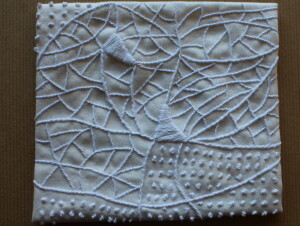 So, Mountmellick whitework – a bit of a departure for me as I’ve not previously tried this technique. However, I have now crawled my way to the end of the second module of the Stitchbusiness Masterclass and it’s time to abandon colour for a while and to examine texture in some detail. Over the next few months I will be trying out some different whitework techniques and I’m looking forward to doing something a little different. 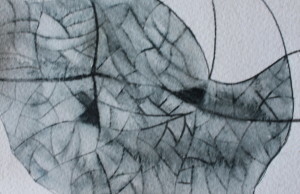 For this piece I used an abstracted leaf design that I created several months ago. I did not follow the design exactly but instead just tried to get the general idea across. You can see a photo of the finished piece below, and a close-up. I’ve used satin stitch, stem stitch and French knots; this is quite a limited range of stitches and traditional Mountmellick embroidery uses many more. I think my next piece might be a stitch sampler where I try out some more of the stitches. 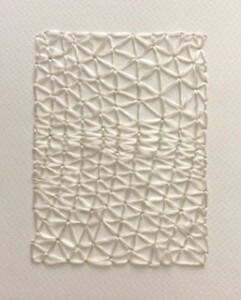 In this piece I achieved a little extra variation by using different thicknesses of Mountmellick thread. This is was fun to do. Because the thread is relatively thick the work grows quite quickly. I think I feel inclined to explore this design further, but perhaps with more contrast and variety. Post updated 6th March 2015 – I really wasn’t happy with the photos in the original post, so I took some new photos with my proper camera to replace the iPad ones. I think it’s an improvement.